The residents of Themb'elihle call it "apartheid dolomite", a geological formation which to their minds seems to hold danger only for the poor and powerless, and not their richer neighbours. But local governments throughout Gauteng face the same problem: they're damned if they rush to safeguard people from sinkholes (as a case before the Constitutional Court shows), damned if they vacillate and definitely damned if they do nothing and the inevitable happens. Even if their concern for life seems a little muted when there is serious money involved. By PHILLIP DE WET. Residents in Themb’elihle just outside Lenasia tend to be deeply suspicious about geology. As far as they can see it holds unseen danger only for people who live in shacks, while those with the money to build double-storey houses or shopping centres are, magically, unaffected. Ask a random citizen of the township about dolomite, and you’ll have a conversation that involves a lot of pointing. Your subject will point to the nice houses across the road, where fairly affluent and mostly Indian families live. There, just metres away, there is no dolomite threat. Your subject will point to a large new shopping centre just metres away in another direction. There too dolomite is apparently not a problem. Where the school stands, nope, no dolomite either. But cross one road, two lanes of tar, and suddenly the ground underfoot is supposedly unstable, unsafe, unpredictable. This, they say, is political dolomite, dolomite that discriminates based on race or class. Apartheid dolomite. Dolomite is a porous rock which, in some cases, can be quite sturdy. However, under certain conditions certain types of dolomite starts eroding from the bottom. Over time a kind of underground dome forms, an increasingly thin roof of rock with an increasingly large void underneath it. Eventually that dome collapses, and the earth swallows whatever is above at the time – houses, cars, people. Experts like Van Niekerk describe sinkholes as low-probability, high-impact disasters. While rare, they are catastrophic when they occur in urban environments. And in broad swathes of Gauteng the risk is high, thanks to a combination of unfavourable rock formations, the use of water by farms and mines and building types. Themb’elihle has been identified as an area at risk of such sink holes, which is why the government does not want to supply residents with electricity. Allowing continued settlement there would be irresponsible, and connecting people to the grid would encourage them to stay. That, though, is hard to explain to people who have lived in the same spot for 20 years and have never seen any disturbance in the ground. In Bapsfontein, not all that far from Themb’elihle, the Ekurhuleni municipality tried to explain the risks to a informal community living under much the same circumstances. Some residents took the warning to heart and agreed to be relocated. Others resisted. Things got nasty. In the end the municipality used its declaration of the area as a disaster zone (just one in which disaster had not yet struck) to force everyone to leave, razing their shacks to the ground for good measure. Because it considered this a matter of evacuation in the face of imminent threat, the municipality did not apply for a court order, as is required for evictions. Some residents, who reckon being man-handled out of homes they have lived in for more than 10 years doesn’t sound like an evacuation, turned to the courts. 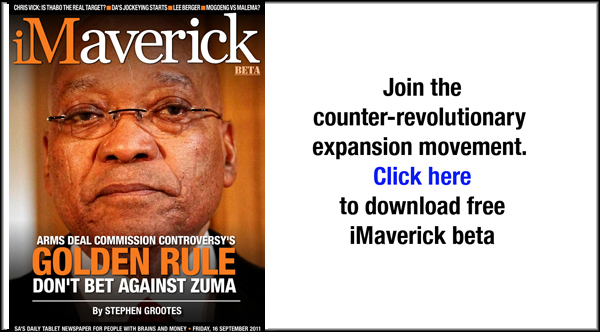 There they were rebuffed, until the matter reached the Constitutional Court on Thursday. That court must now decide if it will consider the case, and if so, whether the earth really could have opened up to swallow the Bapsfontein squatter camp. The Bapsfontein case worries people in Themb’elihle, where rumours of the coming of the Red Ants, those famous removers of squatters, run thick and fast. Much like in Bapsfontein late in 2010, many are convinced that all this science talk is just a smokescreen; in Bapsfontein some believed they were being cleared out for the development of middle to upper class housing, in Themb’elihle rumour has it that Lenasia will be getting a golf course where their houses now stand. 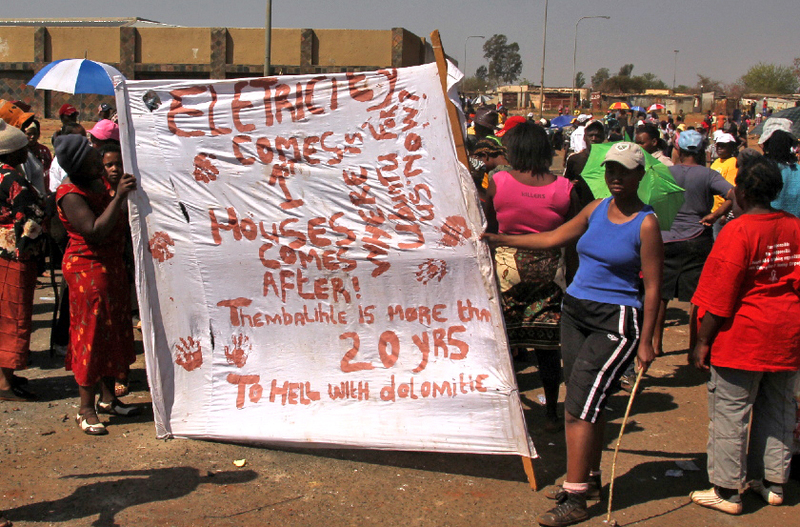 Bapsfontein then and Themb’elihle now also share a certain concern about the danger, long-term though it may be and most residents would be happy to move – so long as it is not too far. In their Constitutional Court application, the Bapsfontein group says there is a perfectly adequate site just three kilometres away from the old camp where they could settle. That still puts them within easy reach of jobs and schools, as opposed to their new home more than 20km away, a commute that eats away a meagre income real quick. Ekurhuleni says the new site has lots of amenities, and was ready and waiting, but doesn’t dispute that there may have been more nearby locations that fall outside of the dangerous dolomite zone. If it loses in the Constitutional Court, the municipality may well have to open negotiations with those unhappy about their relocation and find a new site in any event. The case could also set a precedent that will require all future such moves to be done under court order, which could make for a drawn-out process of years rather than months. Which may not be a problem, for communities that have seen no hint of danger for decades. Or it could lead to a tragic loss of life when luck finally runs out before a municipality can convince a court that it is not being arbitrary and can provide adequate housing acceptable to the people affected. But it does seem that the rich are considered less at risk than the poor; while people in squatter camps are being evicted wholesale from risky patches, a suburb like Centurion is at no risk of being torn down.